إذا كنت تبحث عن فندق بموقع جيد في داروين، فقد وجدت ضالتك في فندق فايب داروين ووترفرونت . إن موقع الفندق الاستراتيجي، الذي يبعد 1km فقط عن مركز المدينة، يسمح للنزلاء بالوصول سريعاً وبسهولة إلى العديد من الوجهات المحلية المثيرة. كما يمكن الوصول بسهولة إلى ‪Darwin Waterfront‬, Wave Lagoon, Di Croco. إن حسن الضيافة والخدمات الراقية التي تعرف بها TFE Hotels تغني تجربتك في فندق فايب داروين ووترفرونت. يمكن للنزلاء الاستمتاع بالميزات التالية: خدمة الغرف على مدار الساعة, واي فاي مجاني في جميع الغرف, مكتب الاستقبال على مدار الساعة, صف السيارات, خدمة الغرف أثناء إقامتهم في هذا المكان الرائع. ادخل إلى واحدة من الغرف 120 وتخلص من عناء نهار طويل بمساعدة مجموعة كبيرة من الخدمات كمثل تلفزيون بشاشة مسطحة, اتصال لاسلكي بشبكة الإنترنت (مجاني), غرف لغير المدخنين, مكيف هواء, مكتب الموجودة في بعض الغرف. صممت خدمات الاستجمام في الفندق والتي تتضمن مركز للياقة البدنية, مسار جولف - ضمن 3 كم, حمام سباحة خارجي, سبا, تدليك لمساعدتك على الاسترخاء والراحة. يشكل فندق فايب داروين ووترفرونت بخدماته الراقية وموقعه الممتاز، قاعدة مثالية للاستمتاع بإقامتك في داروين. It could be so, so good. It sometimes almost manages to almost get there. But mostly - it just doesn’t. This last trip was particularly disappointing. From slap-dash housekeeping (bed barely made and nothing wiped down in bathroom or kitchenette. There were problems checking in, with the Front Desk blaming me for the booking system???? On past experience here, complaints about housekeeping are never taken too seriously. I complained after my last stay, the hotel contacted me to address the issues but nothing has really changed. I will stay again and lower my expectations again. Have stayed a few times here. Close to Chow,( best food ever!) 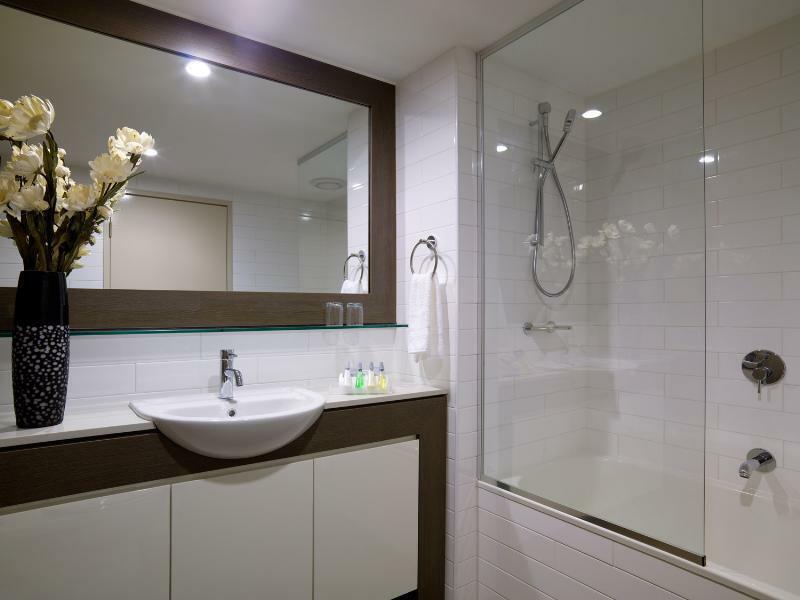 its clean, friendly staff and in one of the best spots in Darwin. Wet Season to view the wonderful storms offshore. great place to have a small break. We did not regret staying in this hotel. The location is perfect. The staff were very helpful. Even if we have already checked out, we were still allowed to come back and use their pool to freshen up after our long drive from Litchfield. Thank you very much!!! Decided to treat ourselves for the weekend to get out of the heat. Pro: pool was shaded so still refreshing to swim in. Good packaged wet season rate. Enjoyed hot bfast for only $5 extra each. Waterfront is a great location for couples or families. 1pm late check out. Cons. Not the cheapest rate Mix up at check in. Hotel was going to charge me for room rate until i showed them that agoda had already charged me. Great location at the waterfront. Staff was friendly, room was very spacious. Bed was comfy also. We had a nice 6 night stay it is our second time staying at Vibe.The only thing that need a bit of of attention is the pool missing tiles on the columns and tiles need cleaning at water line also when entering the water the steps.That is while l only gave 3 stars for cleanliness and facilities. Reception was busy but our check in went smoothly. Room was very clean and nicely furnished. Only issue is that it overlooked the restaurant precinct so we had to keep window closed to reduce noise. Hotel has room overlooking the water. The bed was comfortable and offered a great night's rest. Hotel has walkway leading into the city and is surrounded by parkland bordering wave pool. Lots of shade to sit under and enjoy a picnic. Will definitely return here. We were here for two nights and found the hotel staff very good. The hotel itself is by the waterfront with a number of cafes & restaurants situated very close by although they also have their own Curves Cafe (which we didn't get to try as it was closed the day we went). The pool is a good size and Curves have an open window to the pool area so you can buy food or beverages. There is parking (for a fee) in the next door car-parking station and it has access to the hotel lifts via your room key. 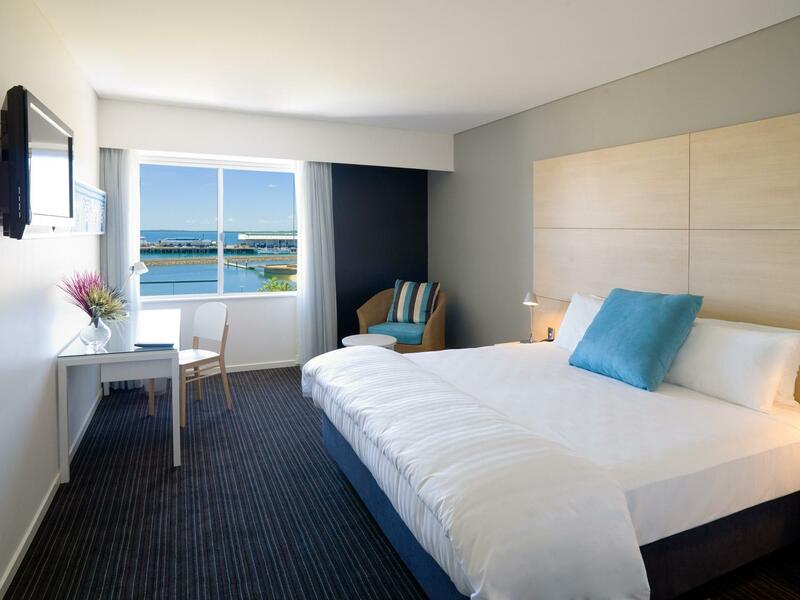 Our room had views towards Stokes Wharf, the wave pool and the lagoon so you could enjoy both day and night scenes. The bathroom had a bath as well as shower so that was relaxing after a swim. The room was kept spotless each day by an obviously conscientious cleaner. We loved it! Location, Proximity to restaurants and bus depot. We stayed for six consecutive nights at The Vibe and once again enjoyed our stay. 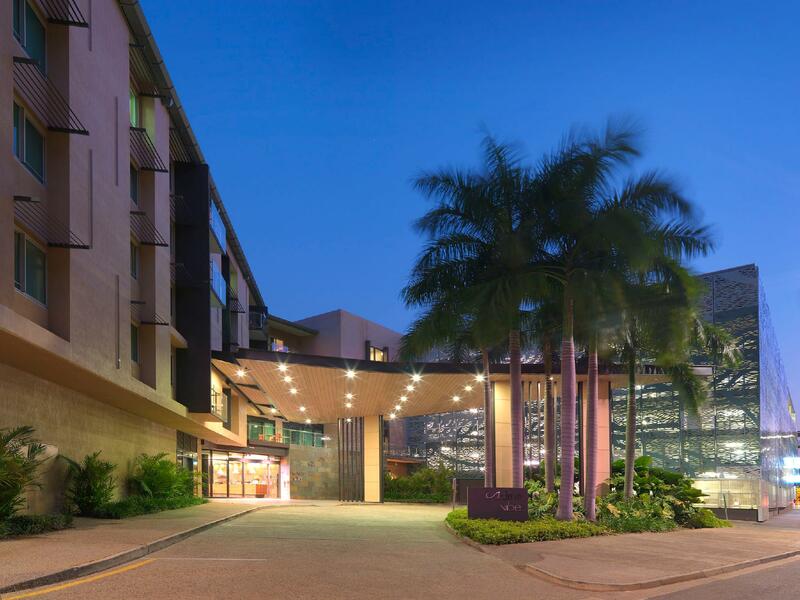 The location of the hotel is excellent with ready access to the Wave Pool, a selection of restaurants and the walkway into central Darwin. The bus depot is also only a short walk away. The gun tunnels are located just over the road and the hop on hop off bus stops just outside the door. Staff are extremely pleasant. The pool area is a comfortable area where you can order drinks and food throughout the day. The restaurant attached to the hotel is an additional charge for breakfast but they do offer a special deal that must be accepted on the first day. They do have a reluctance to clean the rooms daily so ensure that you leave the notice on your door to alert them to the fact that you would like your room cleaned. We did have a shower over a rather high bath that we had to step into and the air conditioning did not seem as effective this visit in thIs room (103) which was a long walk from the main lifts. We enjoyed our stay and would stay here again but would prefer a room at the front with a view over the waterfront. Obliging staff, Central location and efficient air conditioning. Thoroughly enjoyed our stay at The Vibe. We arrived at early hours of the morning and had requested an early check in if possible and they had a room ready for us by 10.30 am which was greatly appreciated. Rooms were comfortable and the location was great, near the Wave pool and a selection of restaurants. The staff were very friendly and willing to help in any way possible.The walkway to the city was close by and it was only a short walk to the bus depot. The hop on hop off bus stopped just outside the door. We would definitely stay there again. The location of this hotel was excellent with the wave pool and restaurants close by. The staff at the hotel were extremely friendly and willing to help out in any way possible. We stayed for twelve consecutive nights at The Vibe and thoroughly enjoyed our stay. The location of the hotel is excellent with ready access to the Wave Pool, a selection of restaurants and the walkway into central Darwin. The bus depot is also only a short walk away. The gun tunnels are located just over the road and the hop on hop off bus stops just outside the door. Staff are extremely pleasant and go out of their way to help in any way possible. The pool area is a comfortable area where you can order drinks and food throughout the day. The restaurant attached to the hotel is an additional charge for breakfast but they do offer a special deal that must be accepted on the first day. Ensure that you leave the notice on your door to alert them to the fact that you would like your room cleaned. We did have a shower over a rather high bath that we had to step into and although there was a balcony there was no door to access this space, which was a shame. We enjoyed our stay and would definitely stay here again. Brilliant. Not the first time and will definately not be the last. Location fabulous so close to everything though this time we decided to order room service for our meals and WOW! Will be doing that again as well. Fabulous hotel.